HOUSTON,Texas (KTRK) -- Construction crews working on Legacy Stadium are nearing the finish line to complete construction this summer. Staff called Katy ISD's new $58 million, 12,000-seat football stadium the district's largest project to date. "Yet at the same time, it has also been the most rewarding just knowing how many students, families and community members it will touch once it is completed," said Nathan Fuchs, KISD director of maintenance and special projects, who agreed to discuss the project via email. The stadium is part of a roughly $70 million package that includes the Academy Sports + Outdoors Student Activities Complex. The complex includes the new football stadium and Rhodes Stadium, according to Maria DiPetta, district manager of media relations and multimedia. The project is on schedule to finish in August-in time for the 2017-18 school year to begin. The biggest obstacle to keeping the project on track was rainfall during fall 2016, Fuchs said. 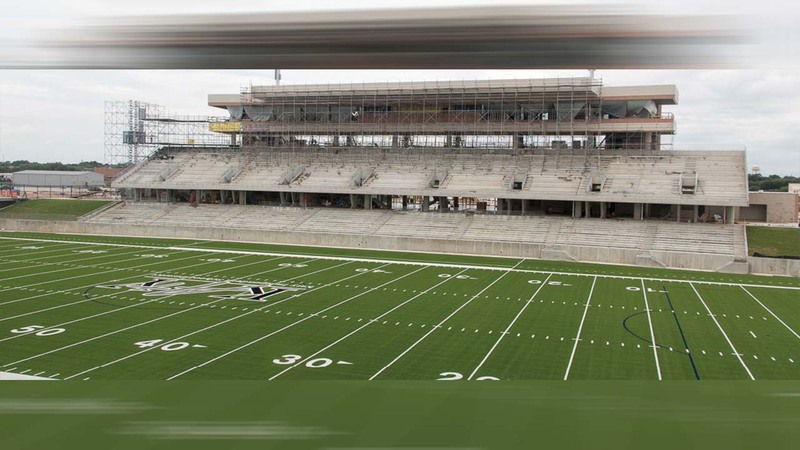 "(The) Katy ISD Construction Department along with Durotech Inc. are currently working on the press box finishes, which include floors, casework, ceilings among other similar items as well as the audio/video systems, the scoreboard and the site finishes, which include landscaping, graphics, signage and fencing," Fuchs said. KISD began construction on Legacy Stadium in fall 2015. To date, the district and Durotech Inc. have spent 370,000 man hours on construction with more than 700 employees helping in the construction process, he said. "Work done on the stadium during the months of April and May consisted of exterior stadium and press box finishes, (Mike Johnston Field) turf, field house interior finishes and site work," Fuchs said. In order to access the stadium, located at Franz and Katy Fort Bend roads, crews constructed new turn lanes leading to the complex. Legacy Stadium will also have 3,450 parking spaces once construction is complete, Fuchs said. The project was initially funded as part of a $748 million bond in 2014 with $12.3 million added from that same bond as well as from refunded 2010 bonds, Community Impact Newspaper reported in December. DiPetta said the extra costs were driven by expenses, such as roadwork, shell space build-out, exterior lighting and a maintenance building for the activities complex. "The complex also includes infrastructure costs, such as drainage, utilities and roadwork," she said via email. It is the one of the most expensive high school football stadiums in Texas history, second only to McKinney ISD's roughly $69 million MISD Stadium of the same seating size, which is also under construction. Meanwhile, KISD anticipates Legacy Stadium will generate more than $500,000 in annual revenue due to ticket sales, concessions and advertising. The district said it will help accommodate student activity schedules. The stadium is expected to have other uses beyond football games. Soccer can be played there, and the fine arts department will use the facility for competitions. Students will train with the stadium's live action media broadcast system, or LAMBS, crew, which operates the video board, according to the district.